Herbs come from the leaf of a plant, while spices come from the bark, root, or seeds. You want to use your array of herbs with the ability to fight infection, uplift mood, bring down inflammation, and cure sickness, but you are being held back by the strange vocabulary. Although you may feel a bit like you live in a fairy tale when uttering them, knowledge of these unfamiliar and whimsical words will put you on a healing track. Astringents are herbal medicines with a high tannin content that cause the contraction of tissue and mucous membranes. They are meant mostly for external use but can also be ingested. These preparations are often used for topical relief of acne and other skin irritations. Herbs are combined with witch hazel or aloe to alleviate symptoms and can be stored for up to six weeks before use. However, they are also helpful for gastrointestinal issues, such as leaky gut syndrome, ulcers, and diarrhea. A cream has a water base, which can be combined with an insoluble element (e.g., olive oil) or a water-soluble element (e.g., glycerin), and uses a bonding agent called an emulsifier. Easy to make at home, creams are sometimes referred to as emulsions. They are meant for topical use and are quickly absorbed by the skin. An extract is a concentrated liquid made by extracting the constituents of one or more herbs in a non-alcoholic solution (e.g., water, glycerin, vinegar) through a maceration process that can take four to six weeks. When the carrier substance used for the process is glycerin, the preparation is often called "glycerite." It is the liquid obtained from boiling herbs in water for around five minutes. It can be made from stems, seeds, bark, and roots, and concentrates the properties of the herbs. Sometimes called tisane and more commonly known as herbal tea, an infusion is intended to extract flavors and medicinal compounds from bark, berries, or dried herbs by adding boiling water. It requires the fresh or dried herbs to be left to steep for five minutes. Infusions have an array of uses, from helping promote sleep and relieving digestive issues to give a boost of energy. Often confused with essential oil, an herbal oil is much easier to prepare at home. It is usually made by macerating or softly heating the crushed leaves and stems in order to extract their properties. Many carrier oils can be used, such as olive oil, almond oil, and jojoba oil. Even a neutral oil like canola can work, although most herbalists prefer organic oils. Liniments are topical herbal solutions used to treat inflammation, strains, and poor circulation. Chopped herbs are mixed with rubbing alcohol and stored for four to six weeks for best results. The herbs are then strained and the solution applied. A poultice is a simple paste made from mashed herbs and water to be applied topically or with soft pressure in a gauze pad. Poultices are at times made more complex by adding apple cider vinegar or whole wheat flour. Although their uses vary depending on the herb, they are mostly used to treat pain, swelling, and congestion. Salves are made with herbs, essential oils, and beeswax (or carnauba wax). They can be very easily stored and have a clean application. They are used primarily to treat insect bites, arthritis, wounds, and sprains. Herbal tinctures are made with alcohol as a solvent, such as rum or vodka, in order to brew a highly concentrated liquid. The chosen medicinal herbs are dampened by boiling water to bring out the flavors, and then covered with the alcohol to fill a tightly sealed jar. 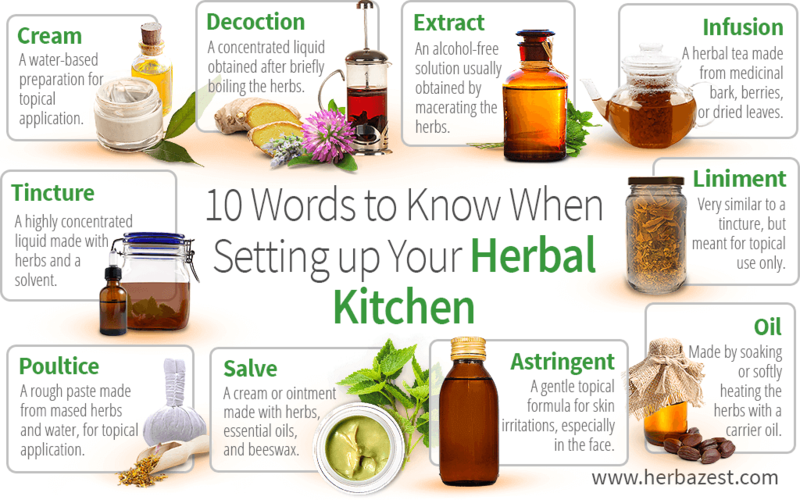 The mixture is stored for three weeks to six months, then the herbs are strained and the tincture can be consumed as drops or by the spoonful. With all this medicinal terminology, you are ready to get started with your botanical solutions.